For him, entrepreneurship has been the loneliest and riskiest journey he has ever taken. Having worked in the B2B industry for years, Logan Tan had long realised that procurement was an extremely time consuming and tedious process, which stood the test of the time despite advancements in technology. He realised that there were quite a few B2C e-commerce platforms in Singapore, but none to serve the needs of businesses. This was the beginning of Eezee, a B2B e-commerce startup in Singapore. “It all started out when I met Darius Ong (who went onto become the Operations Head, but later moved out), at Bishan Starbucks on a fine day. I shared my idea with Ong, and together we brainstormed about the best way to take that idea to reality. We roped in three other good friends to form what was then my initial team with one mission in mind – to simplify the procurement process,” says Tan. But Tan faced his biggest setback yet when his Tech Head, Sherwin Lee, left the team due to disagreements. “His departure was the hardest, which served as a wake-up call. He had been a close friend of mine since my army days. People used to tell me that working with a buddy was always going to be tough, but I used to dismiss this comment. However, with this one incident, I realised there was some truth to this saying,” he shares his journey. Without Lee, Eezee crippled. Tan thought his vision would never become a reality. It was like a tug-of-war for Ong and Tan — they constantly battled and thought to dropping Eezee for good. However, they somehow clung to the idea because deep in their hearts they both saw a good potential for the product, and against all odds, the duo decided to continue to work and develop the platform. The name ‘Eezee’ took birth from a simple discussion and uneventful brainstorming session, which was eventually dismissed with a “go home and think of three names and let’s discuss tomorrow”. “Ong came up with ‘Eezee’ simply because it related to what every Singaporean knows or possesses, EZlink. We chose it because it related to what we wanted to achieve. Furthermore, it was easy to remember,” Tan continues. With a renewed sense of purpose and clarity, the duo knew they needed a technology guy to drive the idea forward. Jasper Yap and Terrence Goh were brought into the team by Joanne Auyong, Incubation Manager at ‘Ngee Ann Polytechnic – The Sandbox’. “We met Auyong during their early days. Since Ong and I both graduated from Ngee Ann Polytechnic with our business diplomas, we returned to the institution to seek guidance as we were stepping into the unknown. With them on board, Eezee took off,” Tan says. Being young and driven individuals, Yap and Goh instilled new energy and ideas into the team. Between them, they had an excellent synergy and working dynamics as they both complemented each other with their expertise. Yap was an expert software developer and Goh a brilliant designer. 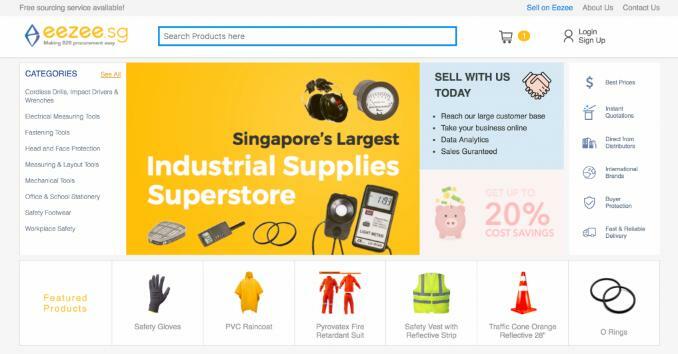 Eezee.sg is a one-stop online store for industrial goods and supplies in Singapore. It is B2B startup for buyers and sellers of industrial hardware and supplies. For buyers, Eezee is an online marketplace that consolidates a wide range of brands and products, so that they can easily compare prices between goods and suppliers. Its catalogue includes safety shoes, safety glasses, safety goggles, safety harness, personal protective equipment, power tools and hardware. As for sellers, the platform helps them to manage sales orders and categorise their stock, as well as source other items from other suppliers when requested to by their customers. 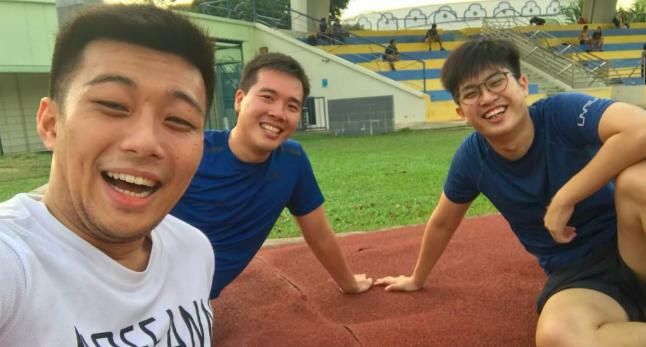 “We bootstrapped the company with just S$30,000. We originally started Eezee as a side business as we wanted to test the idea by using Woocommerce & WordPress as our MVP. When we officially started in October 2017, we took zero salary to sustain the cashflow of the company and we took our capital to hire interns instead. This enabled us to grow much faster. We were also lucky to have met many others that see our vision and hustle together, their willingness to join without any salary have helped us grow organically now,” he tells me. As of August 2018, Eezee has 241 suppliers, 789 registered accounts, 17259 products uploaded, and S$210,000 in GMV, and S$41,000 in revenues. “As a new marketplace, we knew we had to rely heavily on search engines to bring us sales, and we focused a lot on search engine optimisation (SEO) and digital marketing. It was hard to rank for every individual product on Google, and to make matters worse, we needed time to build the domain authority,” he says. Furthermore, it was not easy to convince suppliers and businesses to adopt new (digital) way of trading and transacting. Tan and team had to navigate their way through many layers of business bureaucracy, and it took lots of time and sheer hard work to bring a single supplier onto the marketplace. “Many suppliers turned us down along the way because they were quite comfortable with their existing way of trading, and did not see any value in the new technology and processes. After many rejections, we took time to listen to their concern and derive new ways to onboard them. Now, we have a success rate of 90 per cent of on-boarding a new supplier,” he boasts. By the end of next year, Eezee targets to move into Malaysia, Indonesia, and Australia. The startup is also looking for a seed round of funding. Tan says access to capital is one of the key hurdles Eezee faced in Singapore. Though there are many funds out there, little did they know that fund-raising is a long process. “It is also not easy to get VCs’ support in Singapore especially if you do not have anything outstanding such as an experienced and seasoned management team, or exceptional traction,” he says. “Another key thing is that the marketsize is too small. An acquaintance once told me that for the amount of effort and returns for doing a business in Singapore is not really worth it, for the same amount of effort you can get more returns in another bigger market,” he concludes. The post Infightings, quitting of key people didn’t deter this entrepreneur from realising his dream appeared first on e27.